Workout without sacrificing that hair! Tips for great healthy hair. As we all know, the hardest part about making the decision to lose weight and get in shape is changing the way you eat. You can exercise all day long, but if you don’t make a food lifestyle change, you won’t see results. Plus, changes in the way you eat will show faster on your body than exercise. You will find you have more energy, sleep better, and you are more regular. The second hardest part of dieting, is affording this food change. Eating more fresh produce, meats, and switching to organic can really take its toll on your wallet. Let’s face it; it’s a lot cheaper to eat processed food then fresh. 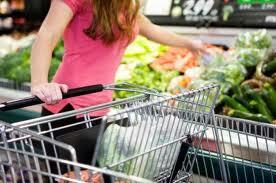 Well I have compiled these few tips to help you in your food shopping and cooking endeavors. In the future, I will be posting a video following me shopping in the grocery store to help you pick healthy options. 1- Shop for in season produce. Summer is great for strawberries, cherries, kiwi, mangos and pineapples. For veggies, try to pick up some summer squash, zucchini, green beans, and ears of corn. Summer salads are great quick and easy meal ideas. If the produce that you want is not in season, buy frozen. They still have the same nutritional benefits and last longer in the freezer. Avoid canned veggies and frozen veggies with sauce and oil. You can add your own. 2- Grill meats and fish whenever possible. You save a ton of calories grilling. The fat melts off and away from your meat, you add flavor from charcoal grilling, and it’s so hot in the summer, why turn on your stove? goulash, and pot roast recopies. They are low cost to make and full of fiber and protein. 4- Summer is a great time to incorporate more fish to your diet. Fish is abundant during the summer months. They are spawning and starting to swim around. Because of this, you can save money and buy fresh fish at your local store for a lot less money. Plus, prices on frozen fish are down as well. I am not saying go buy tons of fish sticks and other Gordon products loaded with fats and sodium. Buy the plain filets. Catfish, whiting, and tilapia are great starter fish and perch as most available during the summer months. 5- Sometimes, frying isn’t so bad. Yes I said it, you can fry sometimes. Stay away from batter dipped frying. That is where majority of your calories come from, not necessarily the cooking process. If you fry, try to use flour coating on chicken and light cornmeal coating on fish. Fry using vegetable oil and do a shallow fry as oppose to deep frying. You will only add about 30 to 60 additional calories to your food depending on the amount of breading. to the taste. Sometimes choosing these alternatives will hurt us in the long run. When they take out all those calories, they take out a lot of natural probiotics and calcium. Even thou the name says it has probiotics, research the brand compared to the full fat version. They don’t have nearly enough. You will end up needing to get more of the fat free version to get the same nutritional benefits of the full fat. no matter what time of year. Buying dried versions are cheaper and give you a richer flavor profile. Substitute these instead of lots of butter and oil to your food to add flavor. 8- Cooking with olive oil cooking spray gives you the same taste of EVOO without the added fat. If you are one of those people who are uncomfortable cooking with sprays such as PAM, invest in a MISO can. These cans are great. You can fill them with your own oil. You pump the top three to five times until it’s hard to do so, and your oil comes out as spray! I hope these few tips help. Remember, small changes lead to big results. 1 Response to "Healthy and Affordable Food Shopping and Cooking Tips"